A truck in Hilo with a sign protesting the construction of the Thirty Meter Telescope on Mauna Kea. Native Hawaiians dance in honor of Mauna Kea at the base of Pu'u Huluhulu on the Big Island. 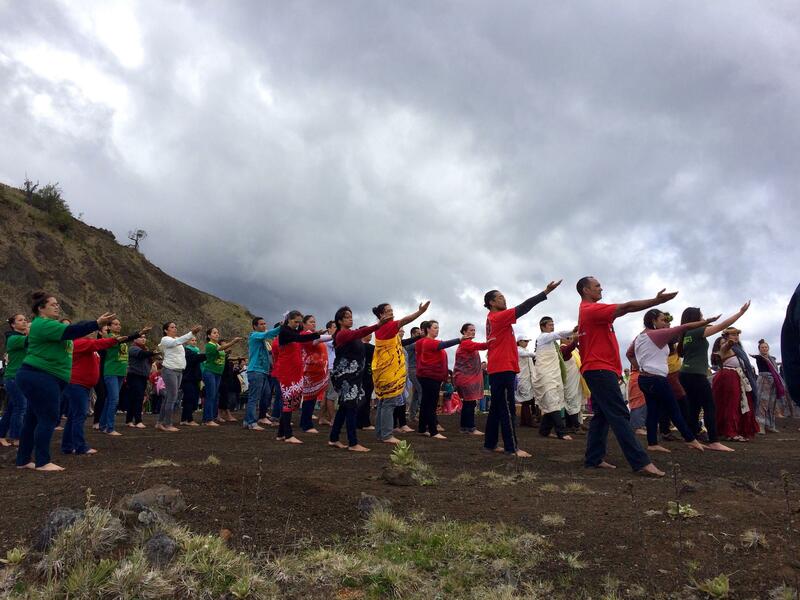 On an overcast morning, barefoot men and women dance hula 9,200 feet above sea level, to a song honoring Mauna Kea, the mountain under their feet. Their hips sway to the beat of a drum as they call out in chant to Poliahu, one of the many Hawaiian gods said to reside in the mountain. Hundreds of protesters who have camped out on Mauna Kea for weeks watch the hula in silence. A gust of wind ruffles an upside-down Hawaiian flag, a sign used to show the state is in distress. "We've been advocating for no more development on Mauna Kea for years. And our words have fallen on deaf ears," says Vicky Holt Takamine, a kumu hula, or hula teacher, who led the dancers. 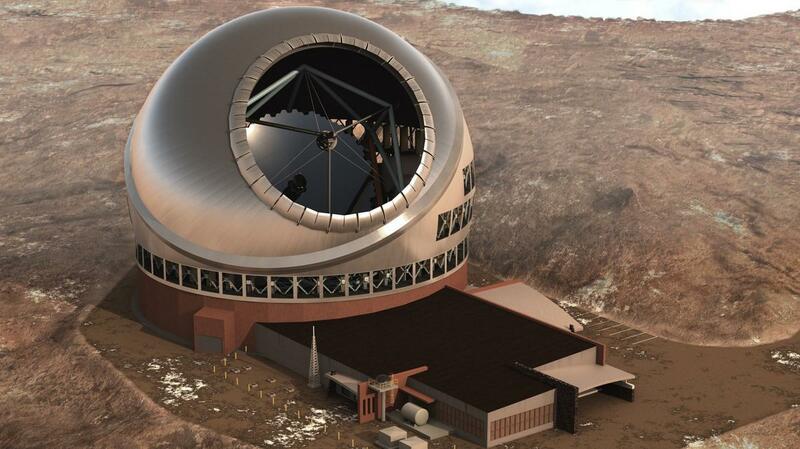 The $1.4 billion project would be the 14th and largest observatory on Mauna Kea. Scientists say the telescope would allow astronomers to see 13 billion light-years away, going all the way back to the origins of the universe. It could lead to greater knowledge of star formation, dark energy and other fundamental questions of existence. "I think there's a perception that there's a sort of a disconnect from the observatories to the community," says Doug Simons, the executive director at Canada-France-Hawaii Telescope. Astronomy in the islands dates back to 1968, when the first telescopes were built along the slope of the mountain's summit, he says. The seven-year process of approving the newest telescope included public hearings and legal challenges, with two appeals still pending in lower courts. Simons says in all his time working on the Big Island, he's never seen this level of opposition. "Completely unprecedented in the history of Hawaii astronomy — no comparison," he says. "And you have to ask yourself, what's the difference? A lot of people are asking that, 'What changed since the last time a big telescope was put up there that has allowed this wedge to be driven in the community?' "
The protests, which have attracted international attention, arose from the indigenous rights movement. For many activists on the mountain, Mauna Kea has come to symbolize a fight for native knowledge, land use and Hawaiian sovereignty. Earlier this month, 31 people were arrested for blocking the road to prevent construction crews from reaching the summit. One of them was 26-year-old Kaho'okahi Kanuha, a preschool teacher at a Hawaiian charter school. He says the battle over 5 acres atop Mauna Kea is about more than just land. It's about a clash of beliefs. "Curiosity should not supersede the values and the traditions of the host people and the host culture," he says. Kanuha says he's not against the science. He points to his Polynesian ancestors, celestial navigators who charted their course to Hawaii by following the stars. "It's the basis of us, the foundation of our kupuna [elders], being able to find new land and create new life," Kamua says. "However we did not desecrate and destroy things to do that." And Kanuha says that's the biggest philosophical difference between the protesters on the mountain and supporters of the telescope. The Office of Hawaiian Affairs have rescinded their support for the development of the Thirty Meter Telescope atop Mauna Kea, changing their 2009 stance on the controversial project. But the board stopped short of opposing the telescope entirely. HPR’s Molly Solomon explains. An artist's rendering of the Thirty Meter Telescope atop Mauna Kea. Credit Thirty Meter Telescope Corp. The ongoing debate over the controversial Thirty Meter Telescope has reverberated beyond the state. Among astronomers, the $1.4 billion project planned atop Mauna Kea has been a point of contention. HPR’s Molly Solomon spoke with a spectrum of opinions and has this report. Emily Rice has spent her career studying low mass stars, brown dwarfs, and exoplanets. She’s an assistant professor of astrophysics at the College of Staten Island, CUNY. And while she’s nearly 5,000 miles away from Hawaii, she’s familiar with the conflict going on now at the summit of Mauna Kea. "I've always known that Mauna Kea is sacred," said Rice. 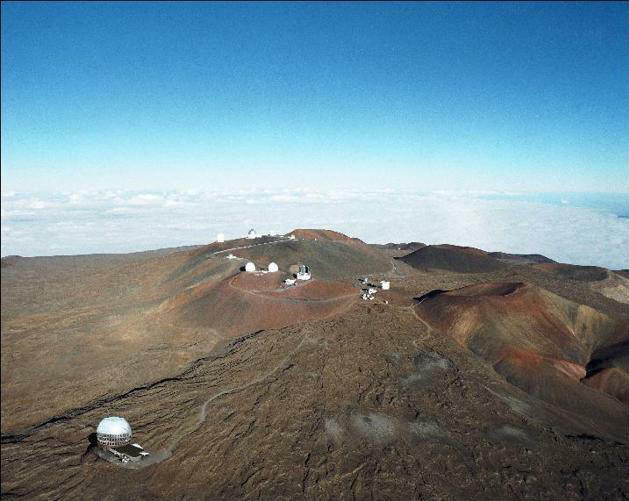 "And I knew TMT was not without controversy"
As a graduate student at UCLA, Rice would regularly use the Keck Observatory for her research, one of the 13 telescopes on the mountain. But it wasn’t until the recent protests, which have drawn international attention, that Rice began to question her stance on the TMT. "I'm realizing that something I've benefited from is something that causes pain to other people. That's something that as a scientist—as a human being—I don't want to have a part in," said Rice. "I don't want to use it if we have to override the wishes of the Hawaiian community in order to build it." Rice is not the only scientist who feels conflicted. Keolu Fox says the protests have dominated conversation among colleagues. A University of Washington PhD candidate in genetics, Fox shared his reasons for opposing the TMT with an astrophysics professor, prompting a larger discussion within the department. As a researcher who’s also native Hawaiian, he often feels like he’s straddling two worlds. "On the side of kanaka maoli, we're put in a hard place," said Fox. "You have to represent your kupuna, you have to represent your ohana. But at the same time we need to publish papers in Nature and Science. This is the currency we use to move forward." Jessica Lu, an astronomer at the Institute for Astronomy at the University of Hawaii at Mānoa, says the tone of discussion changed after last month’s arrests of protesters. "The conversations as a whole were always there, they were always being had between people. But it has intensified in the sense that we talk about it nearly every day now." Lu, a supporter of the TMT, believes the protests have escalated because of a lack of outreach from the science community. "Astronomy just seems so universal to me," said Lu. "I feel like some of this is just an expression of, I wonder if I can do a better job at reaching out and talking to people about what astronomy means to me and to them." Astrophysicist Emily Rice says the discussion has put her colleagues in a position that’s uncomfortable and unfamiliar. "This is something that astronomy has so very rarely had to deal with," said Rice. "We're kind of the least evil of the sciences: we don't do animal or human research, we don't develop weapons, we don't make a lot of money. And so we're not really used to dealing with problems like this." The issue has grown to include questions about diversity within the astronomy community. Next week, we’ll take you to a campus where a short email in support of the telescope has led to a lengthy discussion that still continues. The controversial Thirty Meter Telescope has sparked debate in astronomy departments across the country. Apart from the discussion about the protest itself, questions are being raised about diversity within the astronomy community. HPR’s Molly Solomon takes us to one university. A screenshot of the email from Sandra Faber and Alexei Filippenko that was sent to all UC Berkeley astrophysics students and faculty. Last month Professor Alexei Filippenko, of the University of California Berkeley, sent out a link to a petition in support of the TMT. It included a note from Professor Sandra Faber at UC Santa Cruz and it landed in the inboxes of all the astrophysics students and faculty. "One little email divided an entire undergraduate department," said Phenocia Bauerly, the Director of Native American Student Development at UC Berkeley. She heard about the email through a Native Hawaiian astrophysics student, who was uncomfortable with the wording used to describe the protesters on Mauna Kea. "If that was being said about another group of people who were protesting about something...if it was being said about African Americans or Mexican Americans...I think people would respond way differently and say that was completely inappropriate. I don't think people would sent out an email like that." Bauerly led a tense campus discussion on the TMT project. Nearly 70 people showed up, including a handful of astronomy faculty. Bauerly says what troubled her most about the email was senior leadership pushing their opinion on the entire department. "This is really going to impact how people think about the telescope," she said. "So sending something like that out is irresponsible because so many people look to Berkeley as a leader." Hundreds of scientists have responded with a statement calling the email unacceptable. The president of the American Astronomical Society called it offensive and disrespectful. Janet Stemwedel is a philosophy professor at San Jose State University. She teaches a course on the ethics of science and says her class has been following the Berkeley email incident closely. "It's actually the basis for one of the four case studies on the final exam," Stemwedel says with a chuckle. "So yeah, my students have been thinking about it." Stemwedel called the email shortsighted, saying it dismissed and ignored the concerns of TMT opponents. She also worried the statement overgeneralized the complexity of the situation. "What I'm seeing on social media is younger, earlier career astronomers saying this is a problem. And this is a problem our field needs to address." One of them is Chanda Prescod-Weinstein, a researcher in theoretical cosmology at the Massachusetts Institute of Technology. "There have been native students who have been saying privately, I'm not sure science is for me. I'm not sure astronomy is for me," said Prescod-Weinstein. "And I think that's very alienating." That’s troubling news for John Johnson, an astronomy professor at Harvard University. Johnson, who’s African American, says the debate over the TMT has sparked a broader discussion about the lack of diversity in science. "Mostly young astronomers who are actively engaged in discussions of race and racism right now," said Johnson. "We're really looking to basically tear down the current structure that's in place in academia." Since the email incident, both Faber and Filippenko have issued apologies. Neither wanted to be interviewed for this story. The issue of diversity in astronomy is complicated and can be found across all disciplines in science. Critics like Johnson, say it’s a problem that will take more than an apology to resolve. An artist's rendering of the Thirty Meter Telescope on Mauna Kea. 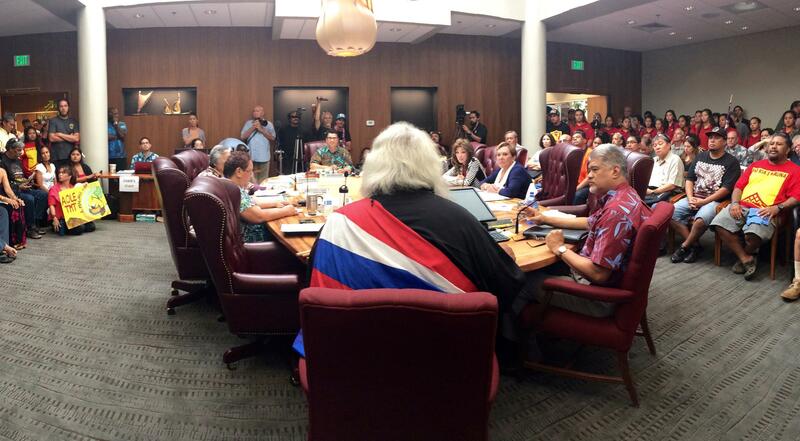 The state’s highest court has revoked a permit for construction of the Thirty Meter Telescope atop Mauna Kea. The Hawai‘i Supreme Court ruled that due process was violated when it approved the permit for the telescope before holding a contested case hearing. 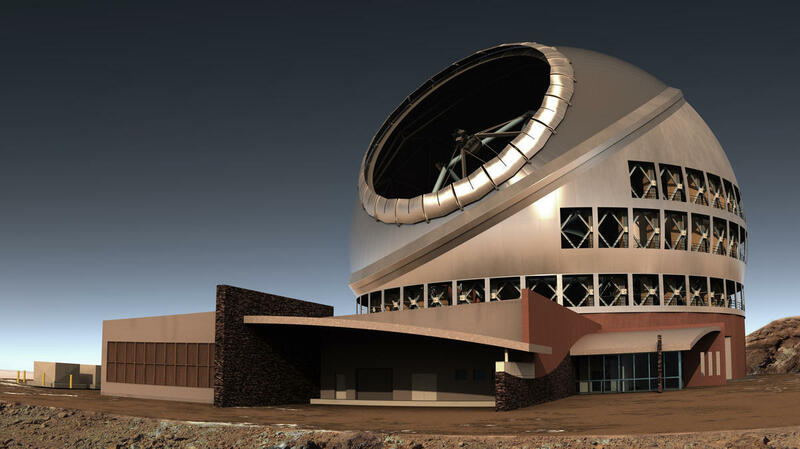 TMT may now have to go through the process again if they still want to construct the $1.4 billion telescope. 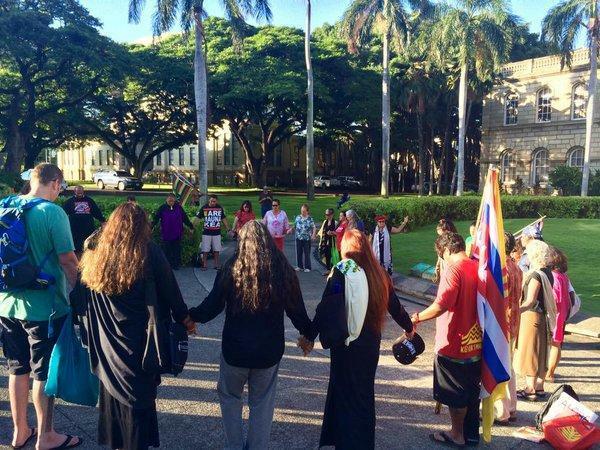 Telescope opponents hold hands in prayer before oral arguments on August 27 for the Supreme Court case challenging the Thirty Meter Telescope. “It is a powerful thing that the court has recognized that process and protection of the cultural and natural resources is important here in Hawai‘i,” said Kealoha Pisciotta, a longtime telescope opponent from the group Mauna Kea Anaina Hou, one of the plaintiffs in the lawsuit.